Yesterday I attended the launch event of the new W3C UK & Ireland office in Oxford, hosted by Nominet (who are hosting the office, not just the launch event). 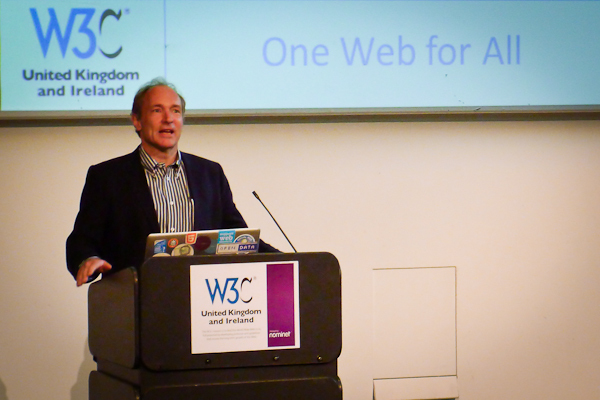 Sir Tim Berners Lee kicked off proceedings with a bit of history behind his invention of the web and the subsequent creation of the W3C, whose goal, Sir Tim told us, is to “lead the web to its full potential”. Around 20-25% of the globe now uses the web but now we have reached a point where we need to look at why the other 75-80% don’t. The W3C Web Foundation (http://www.w3.org/2009/Talks/0318_bratt_WebFoundation/WebFoundation.pdf) is there to tackle this issue and figure out ways to accelerate the take up of the web in the parts of the world that still don’t have it. Sir Tim talked about the role of the web in supporting justice and democracy too (something that the UNESCO report investigates as I wrote previously) and asked the question of how we can optimise the web to support wider and more efficient democracy. Science too. How do we design the web to more easily bring together part formed ideas across people and countries to help these ideas feed off each other and evolve. And how can the web – in this new age of social networking – help us work more effectively and communicate wider than simply “friends of friends”, breaking through traditional social barriers and forming new relationships that may not normally occur? An interesting question from the audience was the one around temporal bubble and how to ensure we can still view the web as we have now in decades to come – after all, so much content from 10 years ago cannot now be viewed (without a painstaking process of content conversion). It was a timely revisit to that question as on the train down I was reading about the hundreds of thousands of photographs shared on the fotopic.net have recently simply vanished due to fotopic going into liquidation. Then the day after I read that Google is now telling users of their Google Video service that they need to move them off there as, while it hasn’t supported new uploads for quite some time, Google will actually be folding the whole thing and putting up the closed sign. So that was all just in the opening talk! and the W3C’s work is ongoing to make it as robust as possible. Dr. Adrian Woolard of BBC R&D talked about their work in Internet TV and how they are looking to free this from the set-top box, while focusing on the accessibility of New Broadcasting products and services. We’ve had the web on our televisions for a few years now, well, those of us with a Wii or Playstation 3 that is. But the Internet will be moving into the TV itself. On this topic the W3C recently formed the Web & Television Interest Group (January 2011) to start looking at requirements that will then form recommendations and a Working Group that will approach the standards issue in this space – see http://www.w3.org/2010/09/webTVIGcharter.html. This is something that I want to take a bit further in a future article, around the web in a Post-PC world. We’ve had the web on PCs for over a decade now, we have it, increasingly, in powerful mobile devices in our pockets, tablets, and now…that bastion of the living room…the TV! This entry was posted in standards and tagged w3c, web. Bookmark the permalink.